Always on may, 25th, hitchhiker’s, fans and enthusiasts of Douglas Adams are celebrating the Towel Day by carrying a towel with them. A tribute to the author of ‘The Hitchhiker’s Guide to the Galaxy’. With he countdown running, it’s time to get a wonderful towel as a homage to D. Adams. 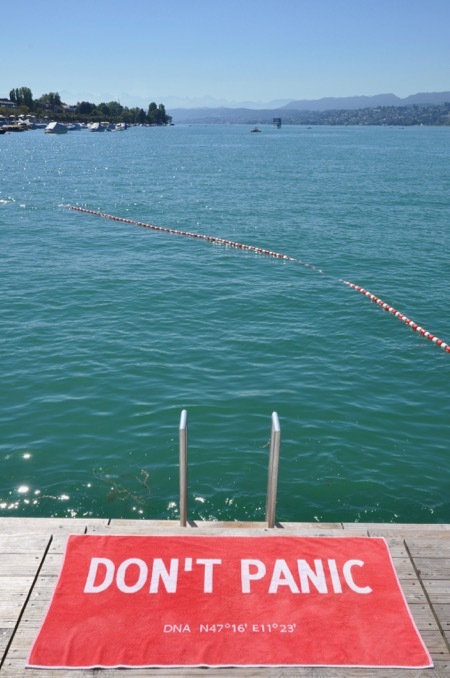 The DON’T PANIC Towel has great practical value. It keeps warm and you can dry yourself off with it. More importantly, a towel has immense psychological value. It features in big letters the good advice for all people in the universe: DON’T PANIC. Posted by Uli Schuster at 7:12 pm on April 13th, 2018. Categories: Don't Panic. Tags: 42, Don't Panic Towel, Douglas Adams, h2g2, Hitchhiker, Towel, Towel Day. Posted by Uli Schuster at 12:53 pm on May 25th, 2017. Categories: Allgemein, Don't Panic. Tags: Don't Panic Towel, Douglas Adams, h2g2, Hitchhiker, Towel, Towel Day.